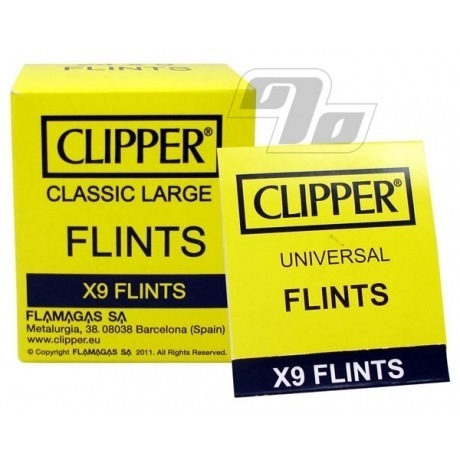 Clipper flints are available to extend the life of your Clipper Lighter. If you want to refresh your Clipper lighter then pick up a pack of flints and keep the flame going. Each pack includes 9 universal Clipper flints which fit snugly in all the Clipper Lighters we sell. May fit other lighters as well like the Zippo. Pair these genuine Clipper replacement flints with a can of the finest Vector butane and you too can be an eco friendly Firestarter. Don't lose the Clipper and you're covered for years. Allows me to keep using my favorite Clippers. They get the job done. I've easily gotten thousand of lights from one Clipper just by changing the flints and refilling the lighter. If you have a coin, you can turn the bottom of the flint. Which will open up to a spring. Put in the new flint and re screw and BAM. The lighter is good as new. If you cannot replace the flint I do not think you have made it past the 4th grade. i love clipper lighters. i should make a note that idiot that i am, when the flint died, i couldn't turn the screw on the flint wheel to make a change so i did the hard way. i gently removed the flint wheel and changed it that way. after that i got the screw to move but am not sure if my removing the wheel affected its positioning and effectiveness, because, i have been having flint problems ever since. so i'm sure how to rate these flints. they seems just like every other flint. they packaging is convenient. like a book of matches with the flints sealed into individual pockets.